I picked up a cute red framed picture at the Salvation Army store almost a year ago. The picture was ugly so I knew right away I’d use the frame as a chalkboard. Issue #1: I didn’t know where I was going to get the “board” since it didn’t come with glass. When I was packing up to move, I discovered a frame that I didn’t need anymore that was the same size and had glass! Perfect! I had bought the chalkboard paint ($10 at Home Depot) a while ago for this very project so I finally set to work. I learned the hard way that just like my other glass projects, you first need to prime the glass. 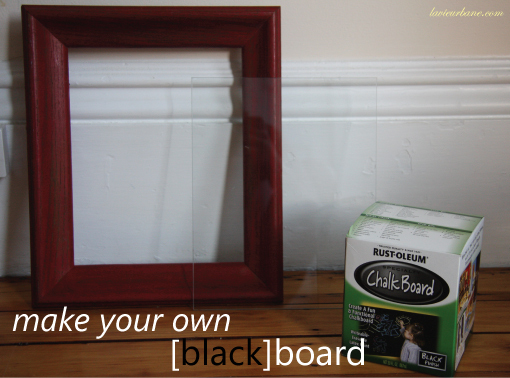 I tried to see if the chalkboard paint would adhere to the glass by itself but the answer to that was no. Thankfully nothing was ruined, I just turned the glass over and got out my “Frosted Glass” spray paint which has been very handy for many projects! 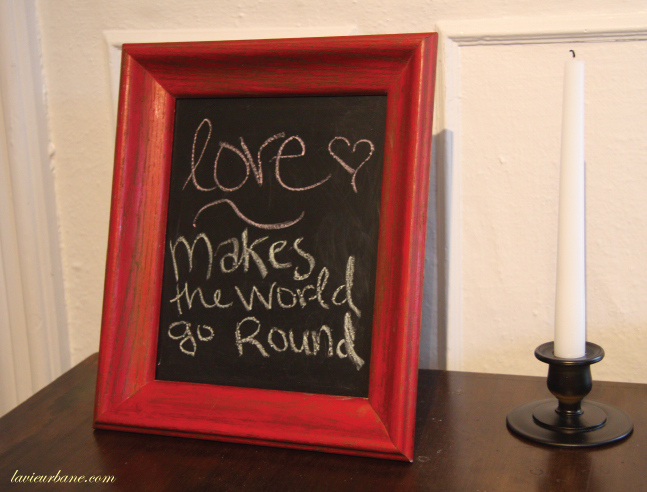 This was truly one of the simplest projects and now we’ve got a cute chalkboard we can write notes on in our kitchen! It’s already helped us to take out the trash on Tuesdays and tend to the laundry…. it’s been very helpful so far!